We stayed in a nice campsite in Riverton overnight enjoying fish and chips by Riverton rocks for supper. We woke to thick fog in the morning brought on by the sunshine of the day before. We got on the road again and drove towards Invercargill. This town has the reputation of being a bit boring but it seemed quite a lively town. 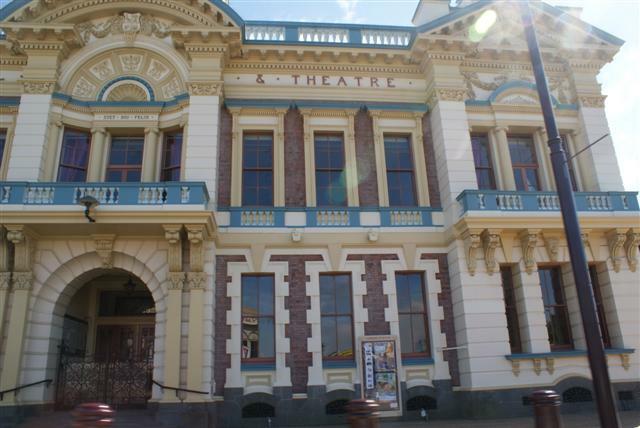 We stopped briefly to have a look at this beautiful building that was their town hall and theatre. As we continued driving the fog cleared to a beautiful sunny day. The Southern Scenic Route passes through the Catlins. 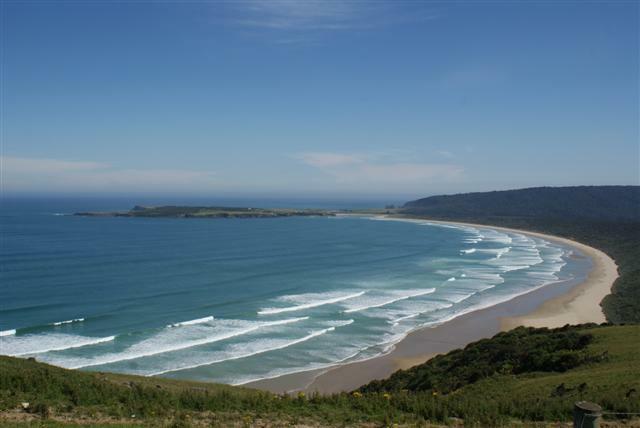 Situated off the beaten track The Catlins encompasses a coastal strip of spectacular rugged coastline and beautiful windswept beaches while inland lie undisturbed forests and enthralling landscapes. 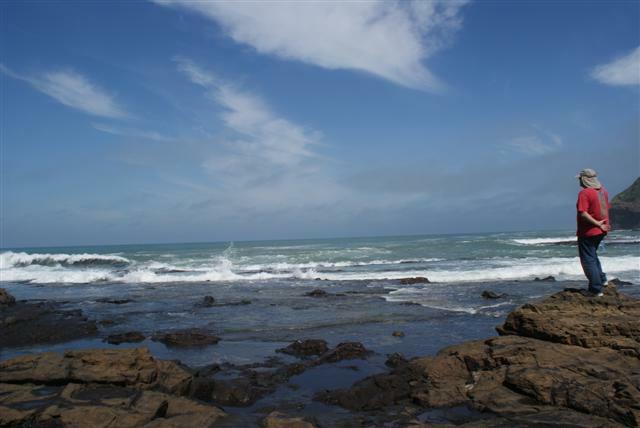 We stopped at Curio bay to look at the petrified forest. This is one of the world’s most extensive and best-preserved examples of a Jurassic fossilised forest. 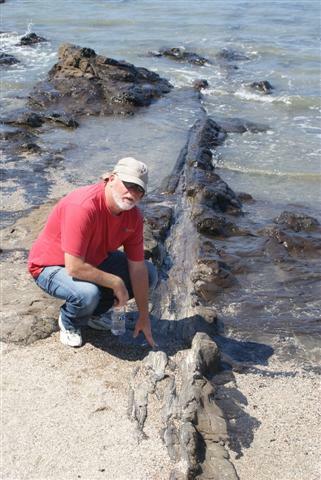 Fossilised trees lie embedded on coastal bedrock 180 million years old Unfortunately the tide was coming in and we couldn’t see it all but it was amazing to be able to walk around the fossils on the beach unhindered. I wanted to go into the Cathedral caves but sadly the tide was in too far. We watched the surf rolling in across the beach. We continued a bit further to Porpoise bay this was the southern most point of South Island. With the clear blue sky we had a breathtaking view of the picturesque sandy beach. 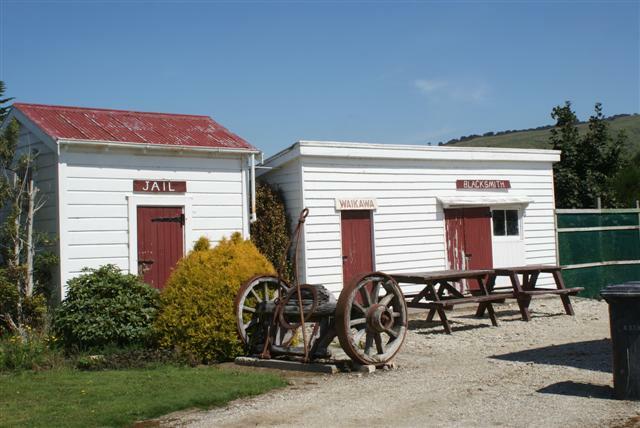 Based in the old school building Waikawa museum contains artefacts and history of the colonial settlers and information on local shipping, gold mining, saw milling and farming in the area. We stopped and had a look at their lovely collection of exhibits before enjoying our picnic. We drove through the beautiful countryside for another hour or two before stopping for a twenty-minute walk to Purakauni Falls. 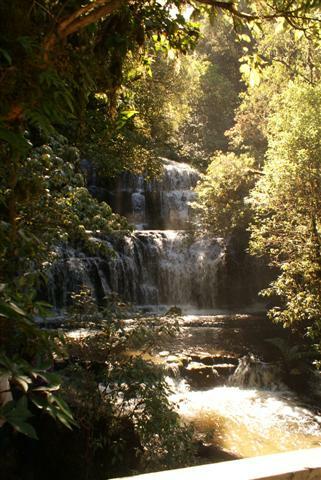 Surrounded by bush this magnificent waterfall cascades 20 metres over three tiers and was a dazzling sight. Our last stop before the campsite was Owaka. 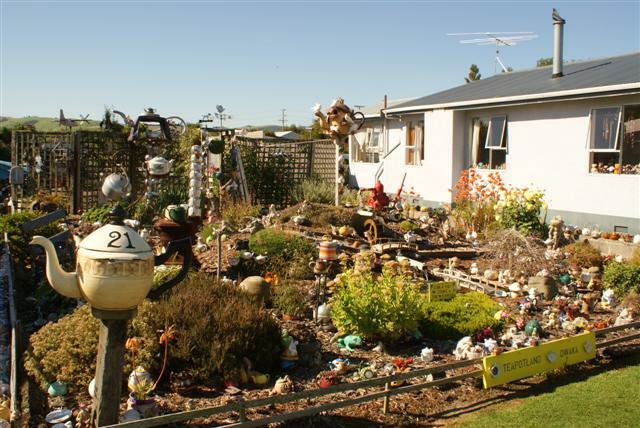 A delightful little village with a wonderful teapot garden. I loved it but I couldn’t count how many teapots she had on display, there were hundreds. The more you looked the more you could see. We drove down the gravel track to the Newhaven Holiday park. As a little girl I was taken to Newhaven in Sussex on holiday many times so it was a ‘must see’ for me. 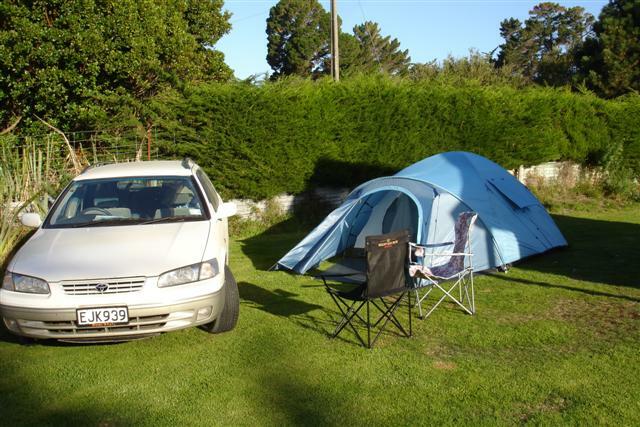 We weren’t disappointed it was a lovely spot and the best campsite we stayed in on our whole journey. Run by Lyndon and Jacqui it was very small with only 10 cabins and a dozen or so camping sites. In the middle was a spacious amenities block with showers, washing machines, a kitchen and a small lounge, which were all beautifully clean and well kept. There was a little veggie patch that you were welcome to pick from in exchange for the odd job or a dollar or two. At the end of the site was a track which led down to the beach. 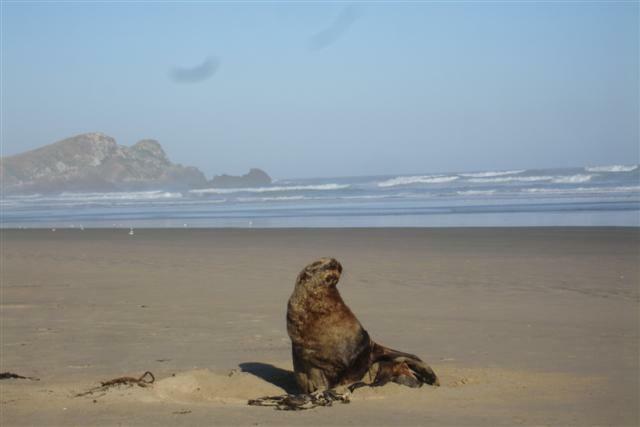 After about a mile of so we came across what looked like a large lump of wood but when we got closer we realised it was a sea lion. I think we disturbed him because he sat up and growled at us but then lay down again. A bit further along there were several others. We left them to bask in the evening sun. While Bill put the tent up I made some dinner then afterwards we sat in an otherwise empty lounge and watched an old episode of Coronation street – it all felt wonderfully normal and there were NO sandflies. We went for a lovely walk on a delightfully sandy beach. Posted on February 17, 2011, in Port posts. Bookmark the permalink. Leave a comment.